Our seminary teachers taught us: Authenticity is a channel for spirituality. Don’t produce yourselves; be yourselves. You aren’t making a statement, you are embodying one. This month, rabbinic pastor and chazzan Katyah Gohr flew to Chicago, bringing her tallit and her guitar. There she did exactly what our teachers had taught us to do. She was, simply, herself. Authenticity can be revealed in all sorts of ways, of course, but it shows up most clearly when something altogether unexpected occurs in the course of a service. Something did go awry on Katyah’s watch as she officiated the marriage of my son, Erik Henning Thiede and my new daughter, Serafina Ha Kim. The ceremony had been unfolding with tender and gentle surprises. There was the Rumi poem Erik had asked Katyah to read before he and Serafina drank from a shared Kiddush cup. I betroth you to me forever. I betroth you to me with steadfast love and compassion. I betroth you to me in faithfulness. 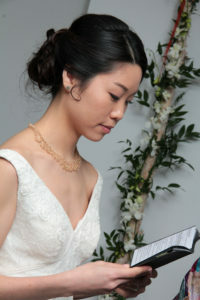 There were Erik and Serafina’s vows, so deeply felt that time itself seemed to pause during the reading. Recognizing the moment, Katyah first asked the two if they were fully willing to receive each other’s vows and then, in the very center of the ceremony, to kiss.It was a hatima, a seal. We all felt it; we witnessed the truth of love – sacred, peaceful, and whole. 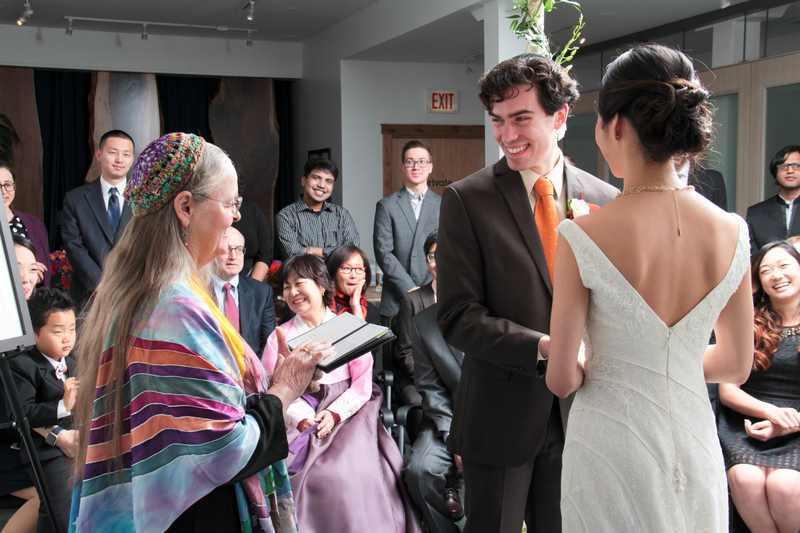 Just a few minutes later, the rabbi mother (me) unintentionally managed to bring a sudden halt to the ceremony. 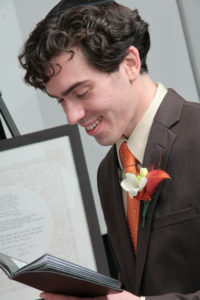 I was sitting very near the table where various accoutrements for the ceremony were located. I glanced over about and noticed the wine glass that Erik was to break. It was standing, covered by the napkin we had brought to wrap it in. Imagining the horror of shards all over the floor where we planned to dance all night and supposing that the participants had simply forgotten to wrap the glass, I reached, as discretely as possible, to take the glass, wrap it up, and replace it on the table. Katyah walked out from under the chuppah. “Not yet!” she said, and gently took the glass, still covered by the napkin, and set it back on the table. I was mortified (and confused). I tried to refocus. Katyah, of course, already had. She sang the Priestly Blessing. She spoke about Miryam, of her dance, of her connection with mayyim chayyim, the waters of life. She read another Rumi poem Erik had selected. Then she returned to the table, grinned at me, and with a gentle but perceptible flourish, she lifted the napkin off the glass, and presented the wine glass to Erik and Serafina. It was filled with water. I laughed, my husband, Ralf, chuckled, and guests smiled. The couple drank, and Katyah brought the empty glass back to me with the napkin. Carefully, tightly, I wrapped up the glass, and a few moments later Erik smashed it without the slightest shard escaping. Katyah picked up her guitar and played Siman Tov. We all stood up to celebrate the couple, the line dance started, and we danced with abandon. I was Katyah’s roommate at nearly every retreat and workshop for all the years I was in the rabbinic program at ALEPH, the Alliance for Jewish Renewal. I knew her good sense, her unassuming way of, simply, being herself when she led a service or sang a niggun. She has known Erik for well over a decade, since he was fourteen. They have sung together – even co-led services together. He knew what he was doing when he asked her to officiate his wedding. I was not surprised by her authenticity, but by the outcome of it: moments no one will forget because they were both unique and real. 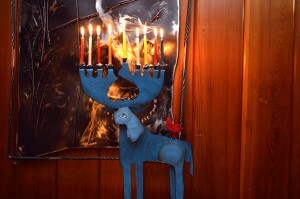 A Thiede Chanukiah; we like moose. Yesterday, I received an email from the spouse of a Jewish person. Said individual is cheerfully colluding in creating a Jewish home. Aha! I thought to myself. Judaism 101, a course which enrolls friends, lovers, partners, and spouses all over the world is in progress. The email clearly reflected the author’s hope to avoid the mania of seasonal commercialism. I am sympathetic. I cease to go into any store of any kind immediately after Halloween. If I do, I know I will be inundated with good cheer. Good cheer and holiday music is capitalism’s sugar-coating for its systemic need to encourage materialism of all kinds. In excess-sius each day-o. “Jews have lived in a largely Christian world for the last two millennia,” I wrote back. “We’ve also lived in Muslim worlds, Confucian ones, and so on. But most of us in the west have been swimming in the currents of Christianity.” I readily admitted that Hanukkah was not the “traditional” time for gift-giving. That honor, I said, fell to Purim. Thus, I explained, Hanukkah began to resemble Christmas in, at the very least, the tradition of plentiful gift-giving. Jewish parents could even find a way to outdo their Christian neighbors. After all, Christmas is just one day. 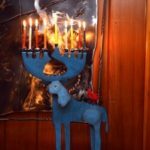 Hanukkah is eight! I know Jewish parents who give one present each night to their children. Oy. One could (and maybe should) consider bringing back the idea that Puri m was for gift-giving, which might also help to support the festival commandment of matanot la’evyonim, giving to the poor. 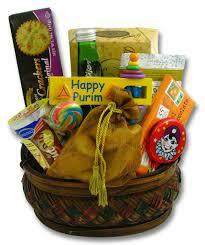 Another perk of Purim? 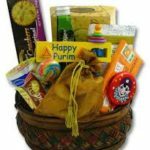 Encouraging American Jews to develop their cooking skills, given that a second festival commandment, mishloach manot, is to send gifts of food to friends and family. Americans could stand to use their kitchen appliances now and again. Hanukkah is celebrated on the 25th of Kislev. The twenty-fifth word of the Torah is ohr (light). A Hanukkah candle takes about thirty minutes to burn. May we abandon malls and stores and online purchasing locales for the opportunities those thirty minutes offer: true rest in the glow of a small and tender light, fragile and short-lived. May our Hanukkah candles remind us that life is precious. May we, this year, give one another the best gifts of all: hope, understanding, and love. We spiritual leaders approach our deployment with joy and hope. We long to transmit the compassion and love of the Holy One of Blessing, to be at work infusing the world with the Shekhina’s light. And then we are brought right down to earth. Literally. Last fall, I arrived to officiate a funeral at a relatively new cemetery in our town. It was small – barren, mostly of trees or landscaping, but featuring a sizable and rather muddy-looking pond at one side. On the other side of the cemetery, across a busy local highway was a gas station and a storefront that had certainly seen brighter days. Though I often do funerals for unaffiliated Jews, I had met the woman whose funeral I was officiating. She had been a witty, acerbic, and, in her way, absolutely charming presence at one of our Hanukkah parties. I knew the kind of culture that gave rise to her style of quips and comments, and I appreciated her intelligence and her sense of humor. She attended my small community’s doings once or twice more; she was not “religious,” she told me, so we shouldn’t expect to see her. Still, nearly a decade later, it was not at all hard to remember her. Her sons told me the way she had become a second mother to their friends and distant cousins but remarked, repeatedly, on her sense of humor. I could certainly recall her loving and witty personality from my own brief encounters with her, so writing a hesped for a woman who had given so much and taken care of so many came easily. The funeral itself was a rather different matter. There were not too many attendees – perhaps about twenty. One came in flip-flops; another took her shoes off during the service. The casket was a bright fire-engine red; I was given to understand that it had been ordered, then rejected, by another family. All appeared to be going well, however, regardless of a casket shining like a fire truck in the sun, the sound of cars whizzing by, and an unusual lack of footwear. I greeted the mourners. I read two psalms and a poem that seemed to capture the spirit of the woman we had come to honor. I was glad to see that the hesped managed to capture her bright and powerful personality. Both sons nodded at me; both had tears in their eyes as I spoke of their beloved mother. It was time to chant El Malei Rachamim. I waited, composed my soul, and asked the Holy One help me convey simple and honest compassion. About ten words in to the haunting, exquisite melody, I felt a sudden, sharp stinging on my left foot. Then my right. While singing, I looked down for a moment to see a crowd of ants congregating in little red minyans of their own, running into my shoes. I saw the telltale sign. 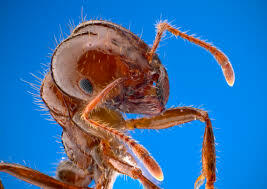 There was a mound next to my left foot and the ants were swarming from its crushed mouth. I went on singing. There was no way to try and brush the creatures off, no way to stop the proceedings, no way to do anything but ask the Holy One – with great and fully spontaneous intensity – for the strength to ignore the fiery pain in my extremities. 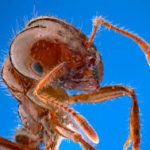 Fire ants are among the many insects I react to allergically. Thank the Holy One. I finished the prayer, competed the service, allowed time for the mourners to say a last goodbye, all the while feeling the flaming pain and itching rise up my legs. Some of the ants had found my calves an attractive alternative venue for their impromptu meeting. When I could, I made my way over to my husband, Ralf, and told him what had happened. “He says sole-fully,” I rejoined. Knowing that such things usually cause violent swelling and a long road of misery and sleepless nights, Ralf did his best to find ways to whisk me home. But mourners also wanted to thank me, bless their hearts, and there was no gracious getaway. Religious leaders have no idea what they are getting into when they feel that call to serve. You can’t dream up the things that will happen at life cycle events, in your communities, at the lecture you thought would go so smoothly. My only advice: Be prepared to be brought back down to earth.